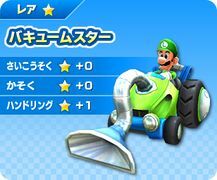 The Vacuum Star is Luigi's kart that appears in Mario Kart Arcade GP DX. It features increased handling with no other bonuses. It is shaped like a vacuum cleaner, similar to the Poltergust 4000 from Mario Kart DS. It has a green and blue design, like Luigi's signature clothing colors. Its Type S alternate color is red and gray while Type X's color is yellow and black. This page was last edited on October 29, 2018, at 15:10.